An ideal solution for sport fishermen and racers. Extreme performance and excellent sailing properties allow the owner to reach the desired location regardless wind and waves. 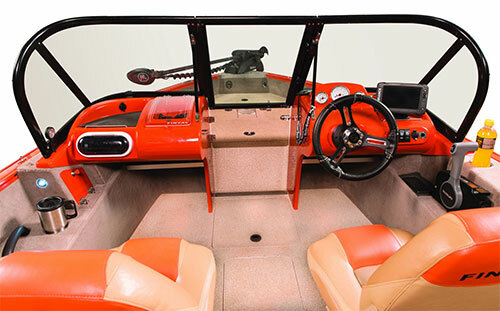 You will feel comfortably at the speed higher than 80 km/hour thanks to glass covered board. Neither rain nor wind will make transfer to new places uncomfortable. 10 – 15 min. sailing in such weather conditions used to disable a racer for a longer time. This shall not be the case with this boat. Dry and spacious boxes, storage boxes for 10 rods up to 2.7 m length, ventilated storage premise everywhere, two fish tanks. 555 Sport Angler is a boat specially developed for the racers needs and the best product made by Finval so far. Video Finval 555 Sport Angler. Review by Andrey Pitertsov. 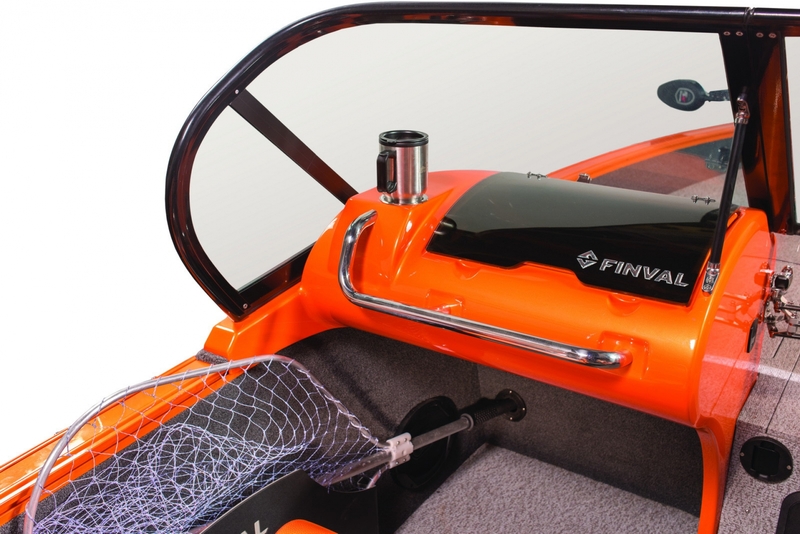 Finval 555 FishPro deserves the right to fight for the title of best boat, and not only among ours but also among the overall competition of welded vessels in this category. It combines great seaworthiness, stability and comfort. 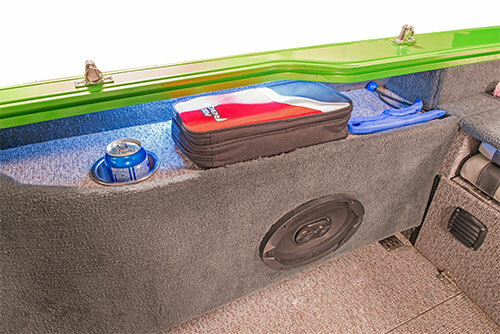 Storage compartments are everywhere and contain all what you need to have with you. 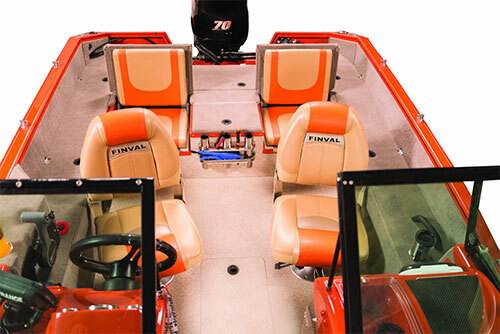 It is the largest and best equipped boat from Finvalu. 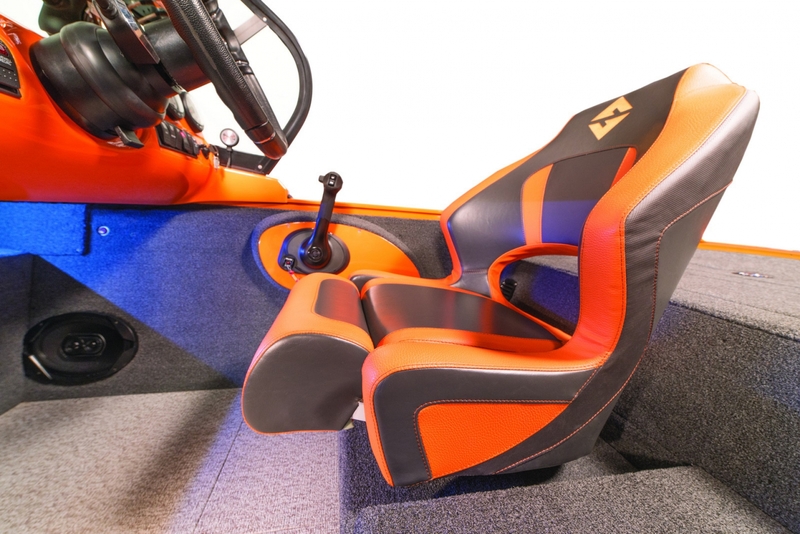 The FishPro 555 is produced in only one version, with a rear deck, the JS - jump seats and the largest rear deck. 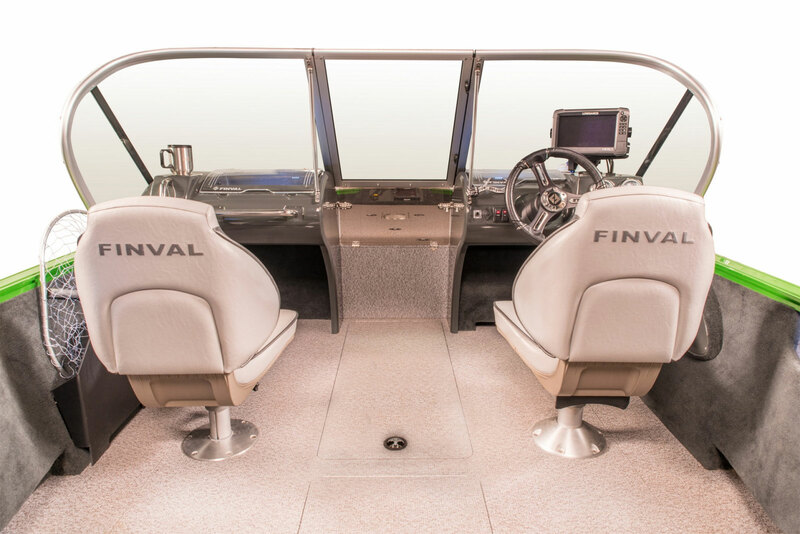 Dynamic sailing, easiness, stability, loading capacity and maximum cockpit width up to 2.3 m – all this is important for comfortable fishing or recreational sailing and it can be found in the new model Finval 550 Evo. Multipurpose storage boxes located on the boat sides can be used for storage of all what you need during the sailing. 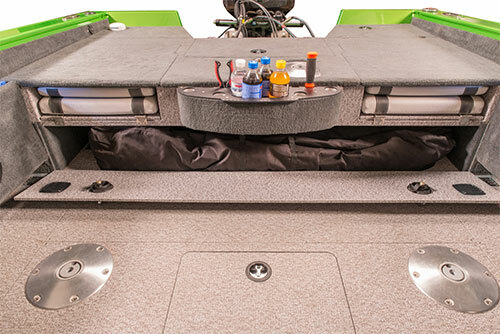 These special boxes have a place underneath for feet pressing down in case of high waves. Prolongation of the stern area represents another advantage of the model 550 Evo, providing for an easy access to the motor and propeller, increased stability and larger rear board area, significantly increasing comfort during fishing. 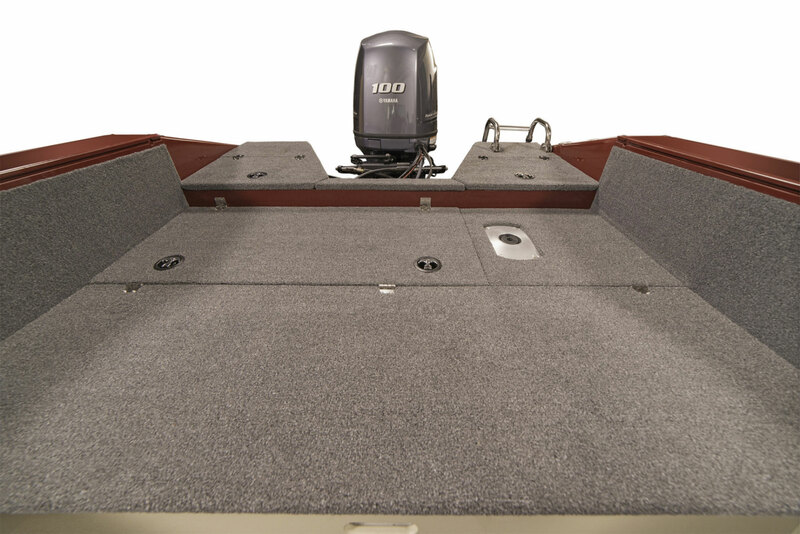 These surfaces are out of water reach during sailing slide, which positively impacts upon the boat dynamical properties. 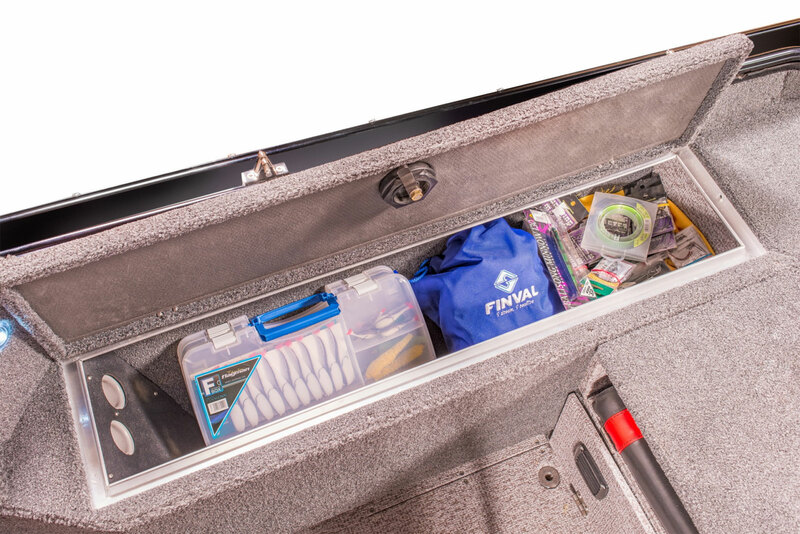 The Finval FishPro 505 has everything you could want from a 5-metre fishing boat. 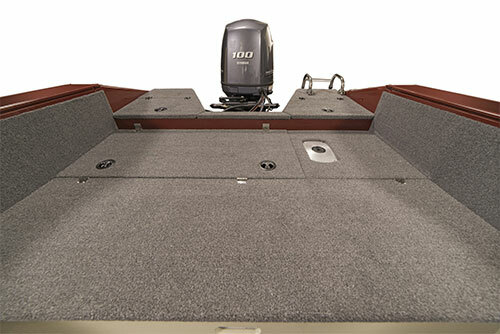 An extremely robust body and strong structure are the basis of this boat. 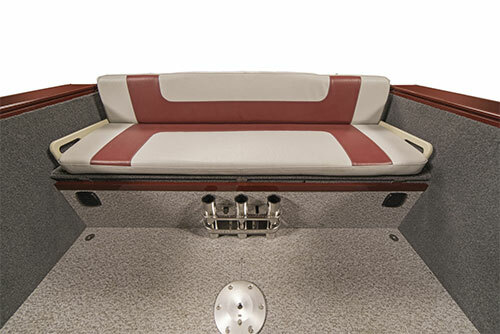 It is perfect for large rivers, reservoirs a and has no problem at sea. A dry cruise is guaranteed. 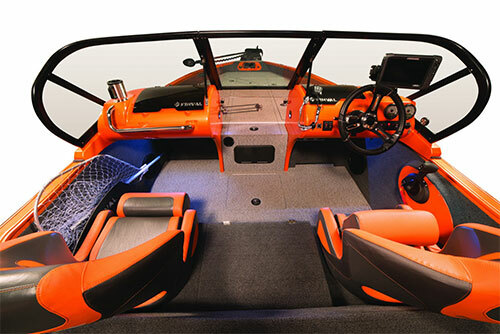 Absolute safety of passage through waves at any angle, possibility of turning the boat at a speed of 50 km/h, which you can not do with just any other boat. 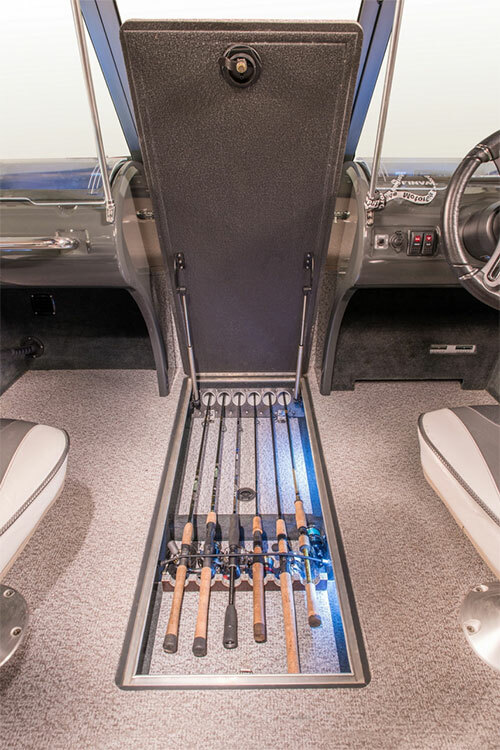 The 505 has a large cockpit, adjustable luxury seats, comfort and everything you need for fishing. 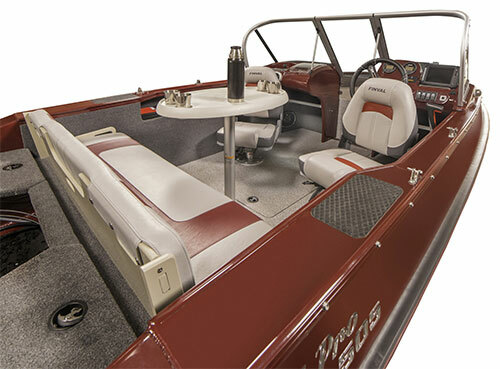 The FishPro 505 is manufactured with three versions of aft deck, the JS - jump seats and the largest aft deck, SP - without seats with more space in the boat, MC – maximum space in the boat without an aft deck. Video Finval 505 FishPro. Changes and improvements in 2016. 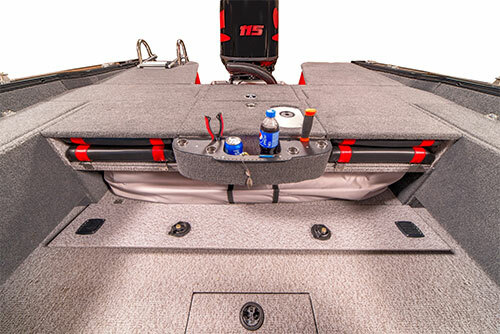 We are often asked: Is there a boat that is sufficiently wide and fast with a small engine capacity? The width of the 475 is 2.12 metres and it reaches speeds of up to 62 km/h with a 60 HP motor. 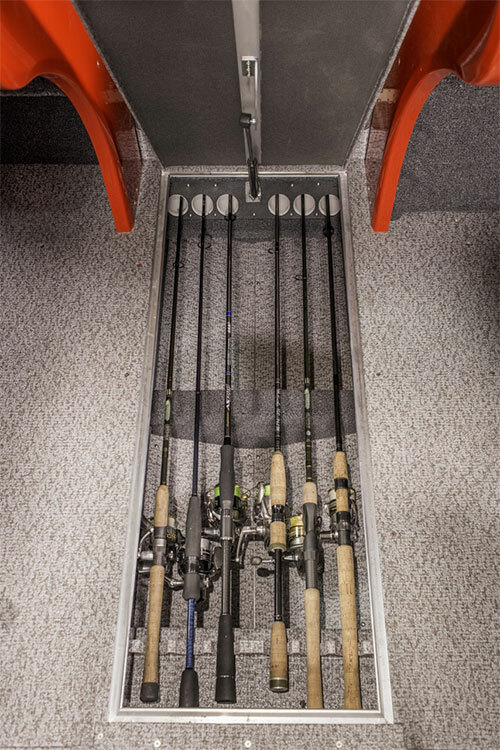 You can fit in 3-metre fishing rods, it has various storage boxes, an aerator, different variations of the deck. 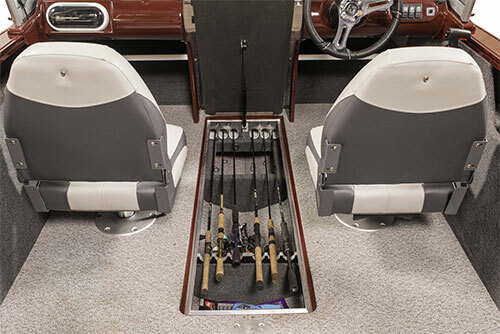 It provides the perfect preparation for fishing and relaxation on the water. 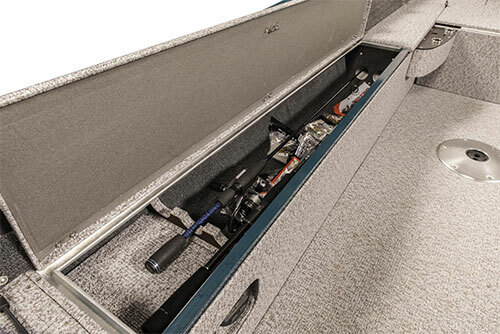 Finval Evo 475 - it's simply one of a kind. The Evo 475 is available with two versions of aft deck: JS - jump seats and SP - without seats for more space in the boat. Video Finval 475 Evo. 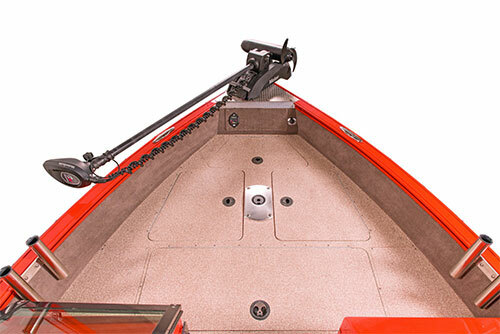 Changes in boat model 2017. Rangy 510 represents a new product of year 2017. Light, fast, well equipped and cheapest – these words can concisely describe Rangy 510. 5.1 m long boat is only 360 kg heavy with fantastic 14.6 m of sea gauge, thus usable also in shallower waters. Rangy can be therefore operated with only 50 horse power motor. 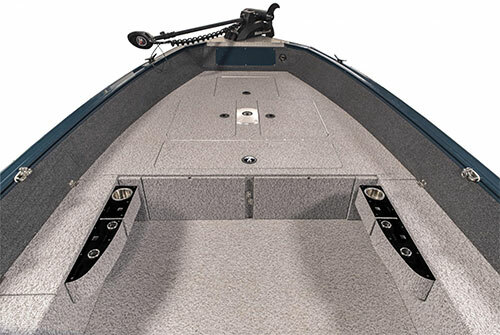 The boat side height is 51 cm, thus sufficient. Rangy 510 is controlled manually, i.e. without console. This means much space in the boat. The front deck is classical of so called "Finval" design that means a wet box for rope, anchor and vests. 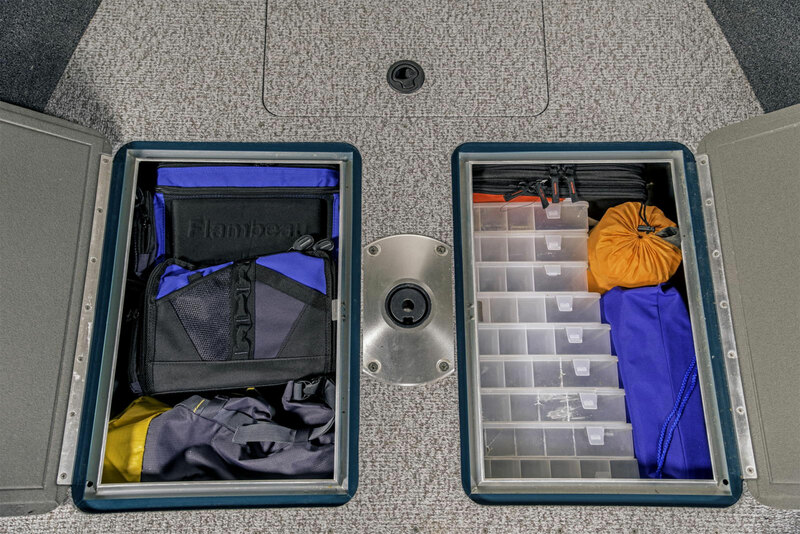 There is a big dry box with left and right hatches, and 60-liter fish box. 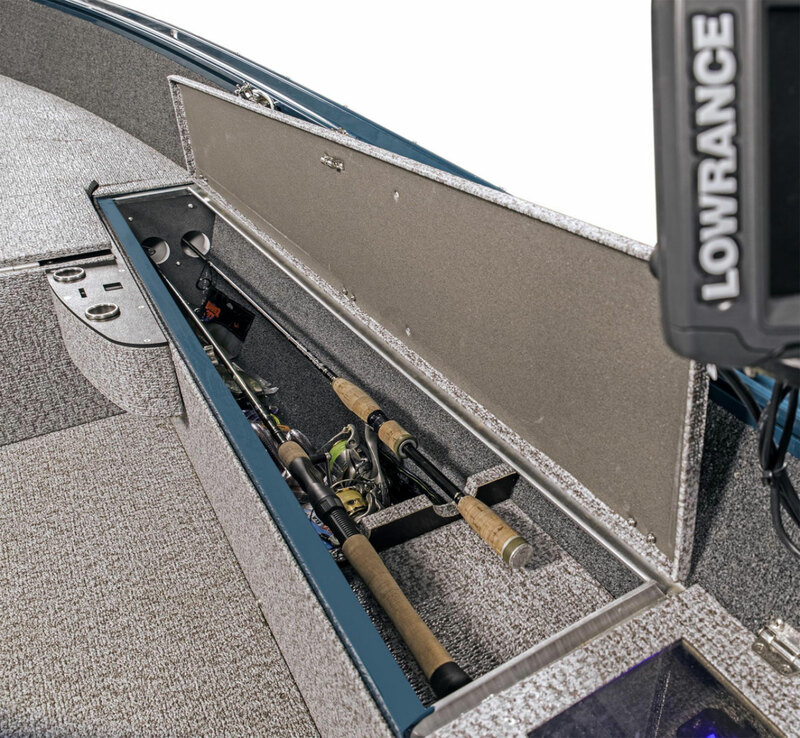 Two boxes for fishing rods are located on the boat sides, as well as a small phone box, and remote control with recharging USB. A box for documents is located just next to it. Sonar cabling solution is very special. It is hidden under a small hatch where you can pull out the plugs from and insert in the sonar. 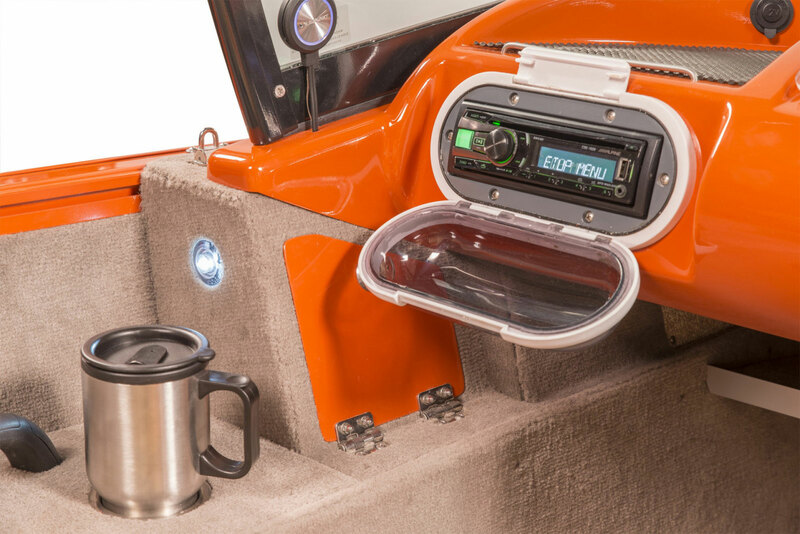 The boat is equipped with inner groove along the perimeter, thus any RAM or Versatrack accessories can be installed there. 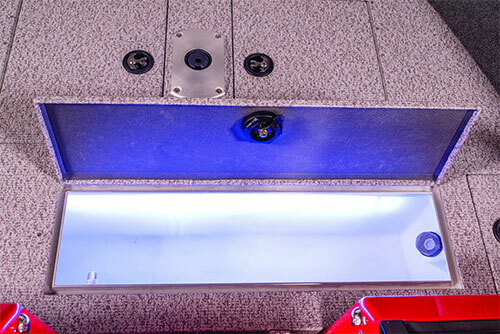 The boxes are ventilated in order to avoid mildew buildup. Electronic panel control is located on the captain´s right side. Batteries are in safe distance from the fuel tank. 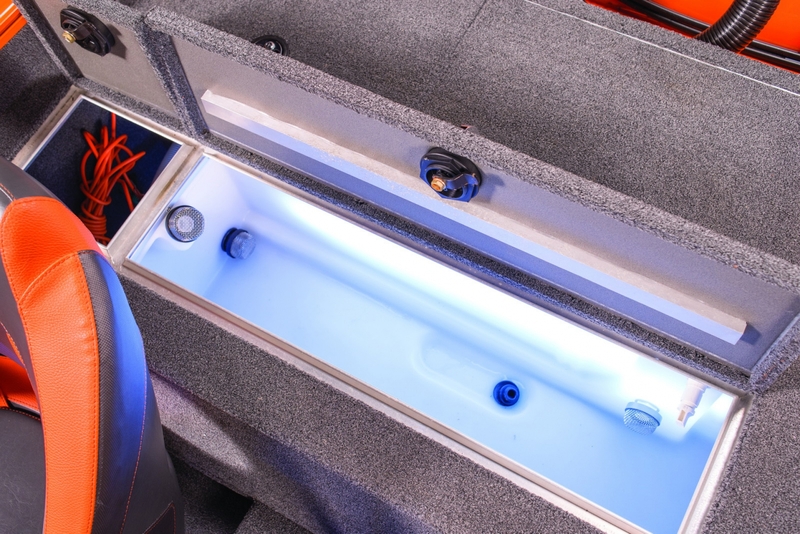 At additional cost, your boat can be equipped with built-in 44 l Alumina tank with fuel filling mouth.